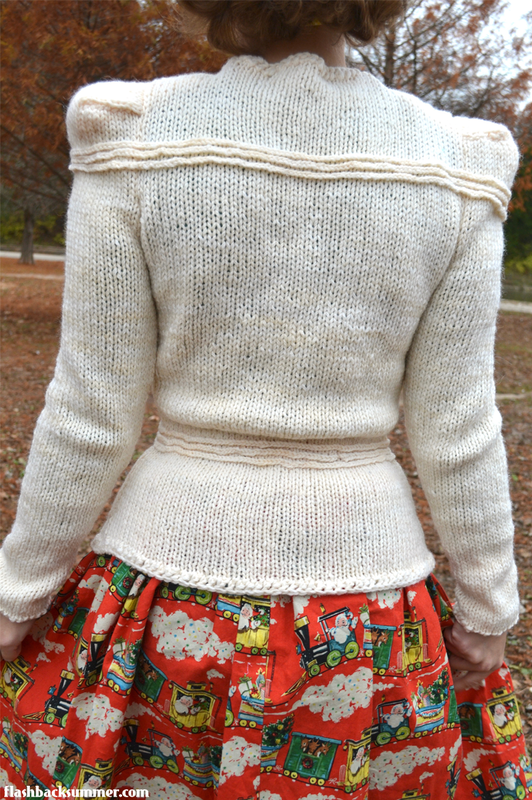 The knitting itself wasn't hard, but I didn't initially know how the decorative stripe bits were attached, and I wasn't sure how to create such a strong shoulder silhouette out of a knit. To make things even more complicated, I wanted to use my deadstock 1960s Spinnerin yarn. Vintage yarn is delightful to have on hand, but the trick was finding a project that would definitely not require more yarn than I had because I obviously couldn't go out and buy more! As I began knitting, my estimates showed that I should have enough. Glory be, by the end of it... I did indeed have more than enough, phew! After knitting up all the pieces, I had to deal with making the stripe detail. 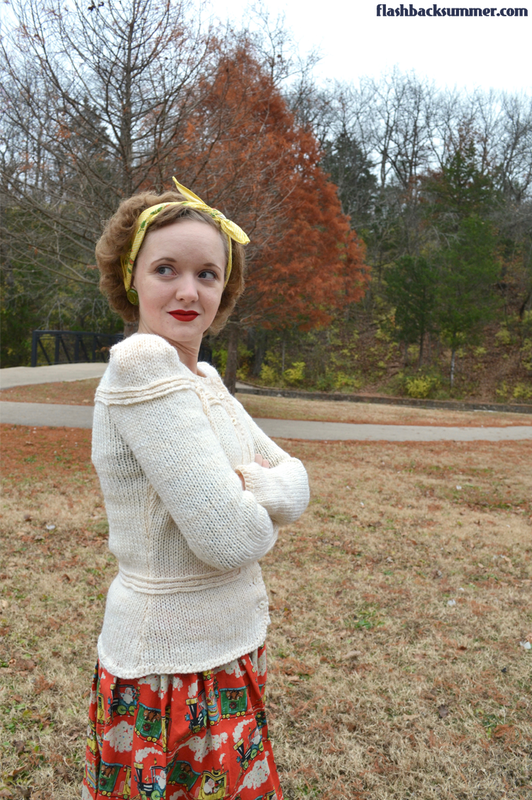 The tricky part with the stripe details on this sweater is that they all require being sewn on by hand. In parallel lines. With correct placement. On a shifty, stretchy knit. It was difficult, but after much anguish... it was done! I worked on the buttonholes and reinforced them with grosgrain ribbon to prevent them from stretching. I did the same on the button side. The last step was figuring out the shoulder pads. The sleeves are box sleeves with two seams that create the right angles. 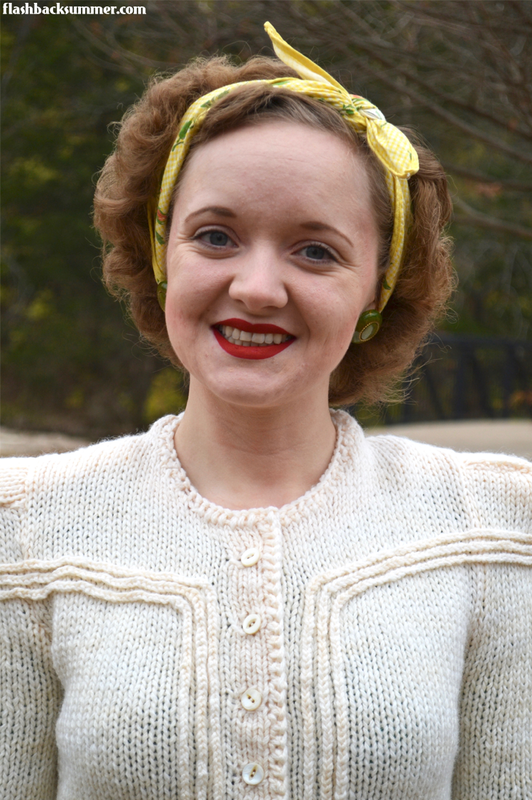 I did a knit/crochet combination and made cheese wedge-shaped shoulder pads that were about an inch thick at the shoulders and tapered down toward the neck. They ended up working quite well, but I realized I should have narrowed the shoulders of the sweater a bit for them to be properly supported. As a fix, I went back and ran a ribbon across the back of the neck to keep it from stretching across my shoulders. It keeps everything a bit narrower so it fits. 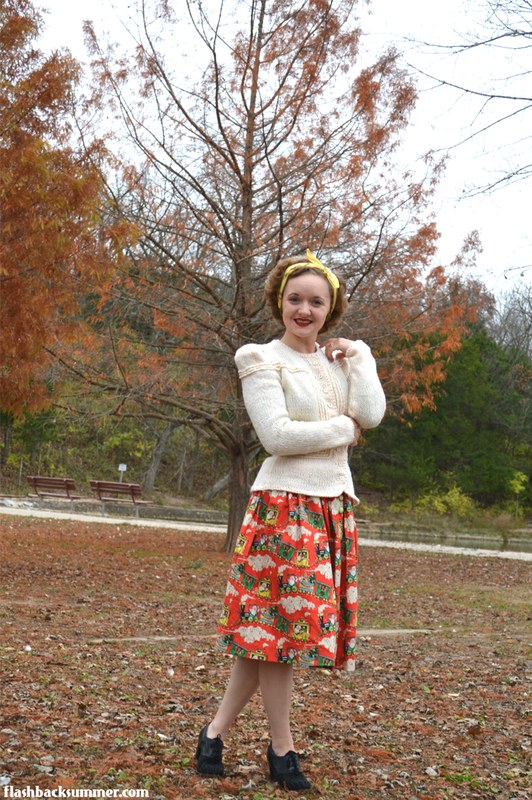 I paired the new sweater with one of my Christmas skirts! December is the time when I get them out, and I joyfully wear them until Christmas! This particular one features a retro Santa riding a train print. I made it using my tried and true dirndl skirt process. 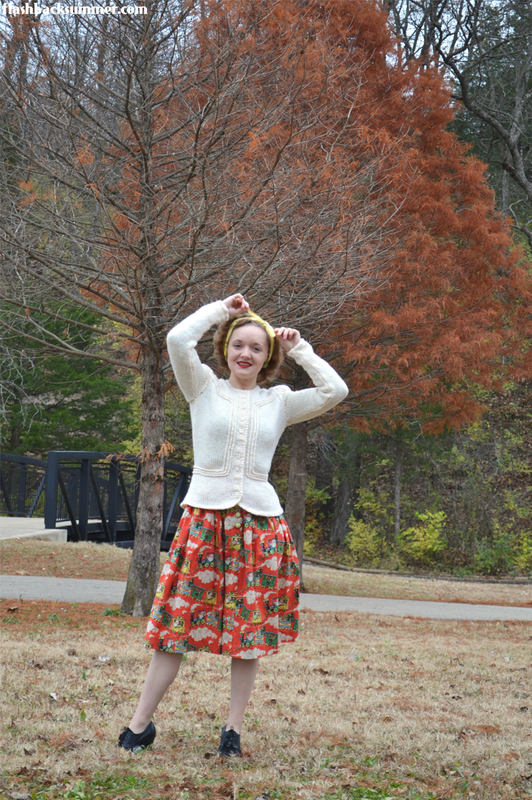 Happily, the sweater stripes ended up being lined up with the waist as they should be, and the way the dirndl skirt layers under the sweater makes for an almost 1950s padded hips look. The stripes at the shoulder and waist create a flattering optical illusion, too, particularly for someone pear-shaped like me! Pattern: Sunglo 40, design 2291 "Streamline"
Any tricky parts to the pattern? Yes, sewing on the stripe details is tedious and tricky. The wedge-shaped shoulder pad shape required is also quite unique. Did you change anything? I did not! Next time I will narrow the shoulders. Time to complete: I never count this while knitting. Too depressing. Total cost: Everything was from my stash (given to me) except the pattern, which cost $3.82 for the whole booklet. Notes: There are no instructions for making a shoulder pad. I found a combo crochet-knit, wedge-shaped pad worked best. The actual knitting of the pieces is quite simple and only requires a knit and purl stitch with a crochet edge. There is nothing like creamy knitwear to make me think of curling up with a hot chocolate in the winter time (although I shouldn't be allowed hot chocolate and pale clothes together in reality). I don't know enough about knitting to comment on the details, but it looks fabulous! I feel the same way but also have the same struggle with hot chocolate and clothing, haha! Thank you, Tanith! That's a bargainous project! It looks very nice on you, though I can see how doing the stripes would be a chore. Wow! You have really done an incredible job! I'm in love with this cardigan. So expertly done too! Very polished finish I too love the light fluffy yarn you have used, looks so cosy, and perfect for this time of year! That sweater is amazing! Love the fit and the trim both. 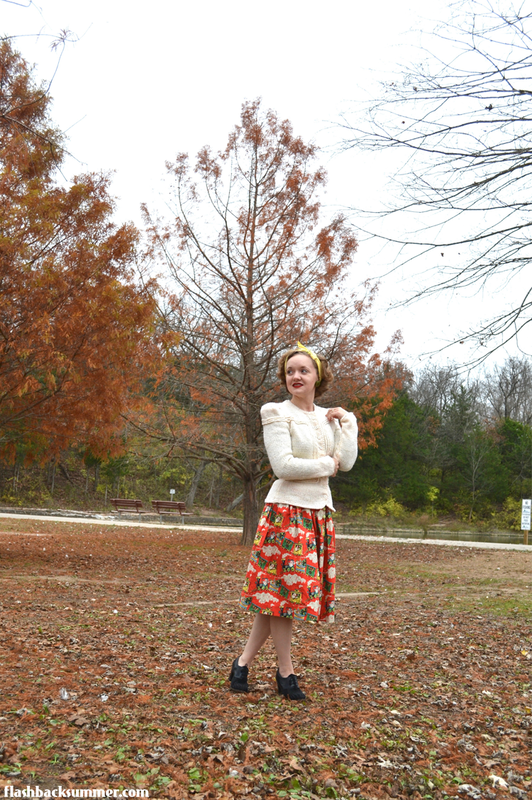 The skirt- I swear I had something, skirt or dress or maybe apron, made from that when I was a wee child in the 50s. The second I saw it my brain said "I know that print!" Ha, I think it's a Joann reproduction of an old wrapping paper or something. And thank you! Wow, I've never seen this sweater pattern before, and it is glorious! You did an amazing job, especially considering you used all vintage materials. What yarn weight is it done in -- DK? Sport? I want to download the booklet for myself, but the etsy link you've included is broken. Any chance you could update it to a current listing (or just the shop front from which you've purchased the pattern booklet)? Ah, nevermind my first question. I see it's a worsted weight, based on your previous post about the amazing yarn find! Oooo, thanks for the heads up on the link! I've fixed it, so it should take you right to the booklet now! And yep, the yarn is a worsted weight. I basically just kept trying yarn and needle combos until the tension was correct. That is adorable! Great Job! 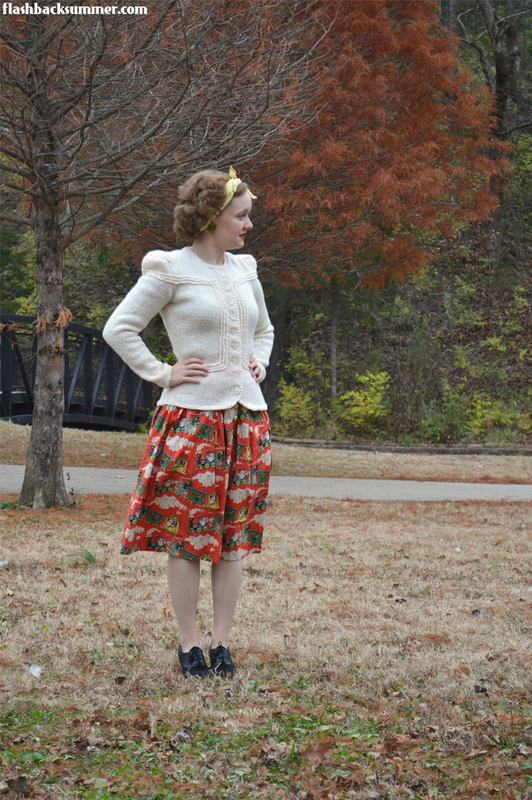 It's got a very trachten/deco look, especially with your skirt. If you ever have to deal with that sort of trim again, I think it's far easier to work directly into the fabric. I would recommend converting to surface crochet chain stitch (remembering to stretch the fabric a bit as you work), or else embroidered chain stitch. I've seen this sweater kicking around ravelry! It looks so gorgeous! What a gorgeous sweater! I've only just learned how to knit and I can't imagine being proficient enough to make something like this! It looks amazing and I love the illusion the lines create! That skirt is darling, too! Kristina it's actually not too hard! It's only a knit and purl stitch for the body, and all the fancy stuff is sewn on later. Wow! That is amazing! You did such a good job, and it fits you really well. Great job with the cardigan. It looks really fabulous. I can see that sewing on the decoration would have been a pain but worth it! This sweater! It is simply darling! Great job! 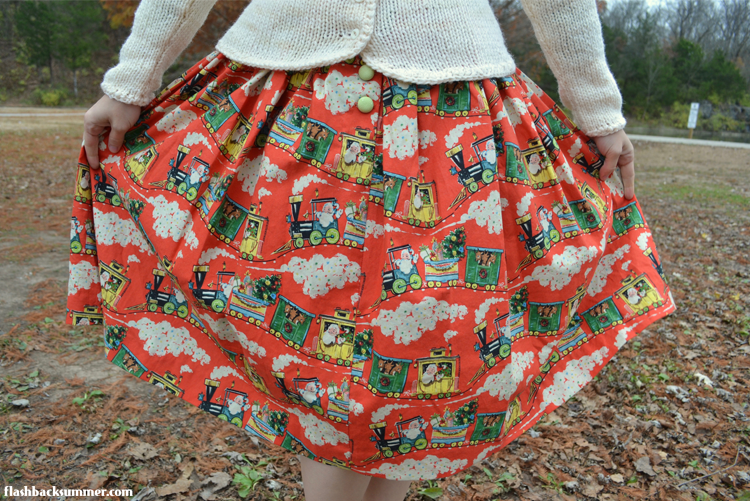 Also what a darling print on that skirt!